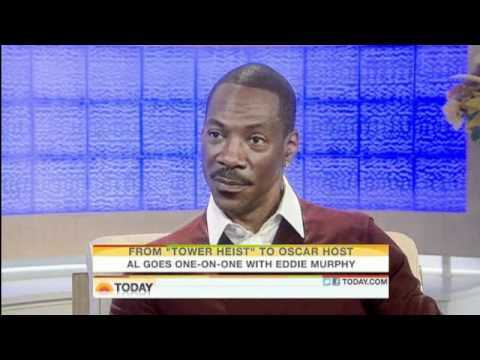 During an interview Tuesday night with David Letterman, Eddie Murphy talked about hosting the Oscars. When asked why he was hosting, Murphy said he wanted to try something he hadn't done before. "It's not all it's cracked up to be," replied Letterman, a former Oscars host. He also asked if audiences should expect singing and dancing. "I'm not going to do any singing and dancing," Murphy told Letterman. "That was one thing when we first talked about [hosting]… 'I'm not doing one of those crazy dance numbers.'" Murphy, who is promoting his new movie "Tower Heist," continued with a short theme song, "You're at the Oscars tonight… You're at the Academy Awards…"